Welcome to The Cut Shoppe-Getting To Know You Blog Hop! The term for the new design team started this month so we are taking a little time to introduce ourselves. If you’ve been hopping along in order you would have come from Zinia’s Blog. If you’ve started here you’ll still be able to make it all the way around because I have a full list of the hoppers below! Be sure to check it out so you don’t miss out on anyone’s projects! 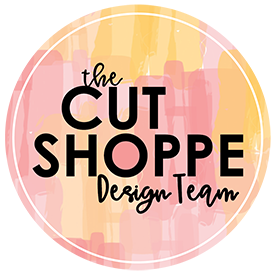 Each blog is offering a GIVEAWAY to The Cut Shoppe so be sure to read through my entire post to see how you can be entered to win! First things first, let me introduce myself! My name is Kelly Janes and I’m so glad that you are hopping along with us! 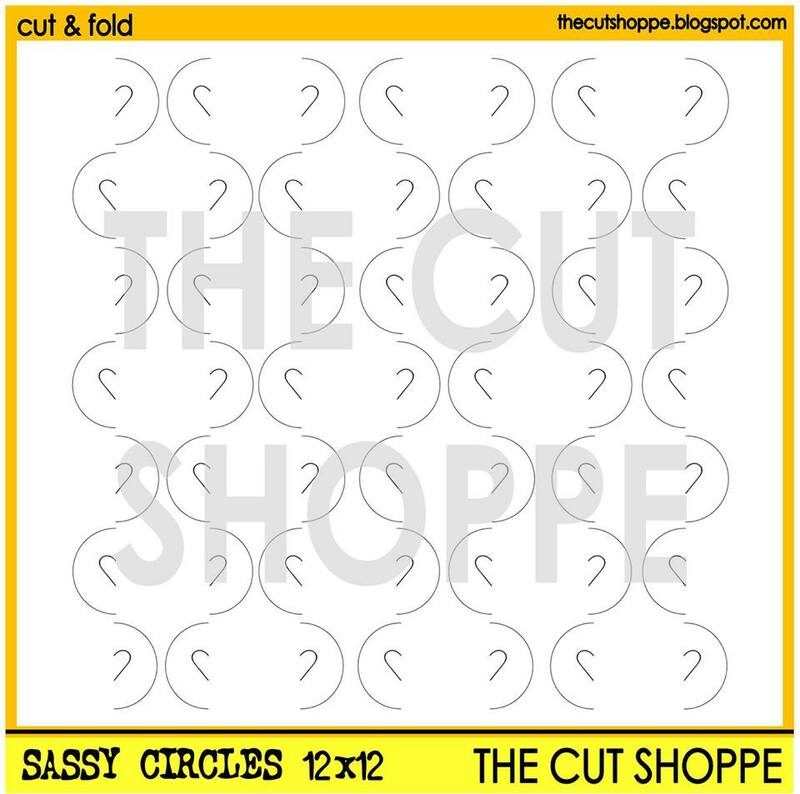 Ashley has come up with fun questions for each team member to answer so you can get to know us better, but before I jump into the questions I want to show you a project I created using the cut & fold Sassy Circles Cut File. I typically scrapbook photos are that 4×6 or smaller so this large 8×10 photo felt a little dooming. That is why it’s been sitting in my craft room since 2010! By using the photo to back the cut file I was able to hide the dark, empty areas on the photo. I used multiple products including patterned paper from the CTMH Magical Collection as my base. I love both sides of this paper-the subtle triangle pattern on the front & the yellow with the small white polka dot print. By using the cut & fold cut file I’m able to see both patterns on my layout! I also added embellishments from Simple Stories Say Cheese I & II, and other odds and ends from my stash. I also created a process video so you can see how it all comes together & it includes a tutorial showing you how I customized the cut file by moving the heart from the center of the circle to the bottom to better fit my photo. UPDATED DISCLAIMER: It is mentioned in this YouTube Process Video that I am not an affiliate with Cricut. Since the publication of this video I have become an affiliate with Cricut. I will, as always, give my honest opinions and only recommend products I love to use. Now here’s a little info so you can get to know me better!! 1. How many times in a week do you work on something scrapbook related? I need to be able to dedicate at least a few hours when I walk into my craft room so I typically only scrapbook on the weekends. I work full time outside the home so it can be a little tricky to find time during the work week. I wish I could scrapbook for 15-20 minutes and then walk away but I like to be able to fully invest myself in the project. I do work on blog posts, social media, editing videos, etc throughout the week. 2. What’s your favorite subject to scrapbook? This one is easy…My family! I love documenting our everyday moments and our adventures while on family vacations! 3. What is your favorite color to use on your layouts/projects? What is your least favorite color? I have two favorite colors….yellow & teal! My least favorite color? I’d have to say purple, mainly because I do not use that color very often. 4. Why do you like using cut files on your layouts/projects? Cut files completely transformed the way I scrapbook! I love how versatile they are! They are like an embellishment and a feature design element wrapped in one! 5. What are some of your other favorite hobbies? If you were not a scrapbooker, what other hobby do you think would consume most of your time? I enjoy reading and cooking. I don’t do either very often but I do enjoy it! If I wasn’t a scrapbooker another hobby that would consume my time…Is binge watching Netflix considered a hobby?!? Ha!! I would love to try gardening. I’ve tried it in the past and have failed every time!! 6. Tell us 5 things we don’t know about you! #1. My favorite Saturday morning tradition is to grab a cup of coffee and catch up on YouTube process videos before my kiddo or husband wake up. #2. I collected papercrafting products (stamps, paper, embellishments, etc) for almost 2 full years before I did anything with them! #3. I tried scrapbooking at a younger age (14 or 15 years old) with my mom and sister and hated it! I went to a crop with them and actually left early because I was bored out of my mind!! I started my collecting phase after I was married because I wanted to scrapbook our wedding, but I didn’t dive in head first until after my son was born. Now it’s one of the things I’m most passionate about! #4. I’m addicted to Pretty Little Liars! I’m almost embarrassed to admit it, but it’s the only thing I watch when I scrapbook. Don’t judge me! HA! #5. If you watched my process video or have been following my blog then this isn’t a surprise, but I’m a Cricut user! Stay tuned for more process videos showing how I use cut files in Cricut Design Space. Now onto the GIVEAWAY! It’s simple & easy to enter the giveaway! Just leave a comment on this blog post by July 10th. (To leave a comment-click the number at the top of the page next to the title) A winner will be chosen randomly & will receive a $5 gift certificate to The Cut Shoppe Etsy Store. The winner will be announced on The Cut Shoppe Blog on July 13th so be sure to check there to see if you were one of the lucky winners!! Next up on the hop is Enza! And here is the entire list of hoppers in order just in case you get lost as you are making your way through the hop! Thanks Zsoka! I don’t even want to tell you how many times I’ve watched & rewatched the series! HA! Well now that was just so cool! I saw the cut file and wasn’t sure what it had to do with your layout. I didn’t even know it folded over. Duh me! I will have to look more closely at some of the background files now. Thank you so much!! Yes, be sure to check out The Cut Shoppe!! There are so many fun cut files!! I love how versatile they are!! Thank you so much Enza! I couldn’t agree more about cut files…it trims down the need to purchase every single element available w/ a product line. They make the perfect elements! I think I use cut files on 95% of my layouts! I absolutely love how versatile they are! Beautiful picture, love the layout. Congrats on joining the team! Fun layout! I love how you worked with the large photo. I would’ve been afraid of it too! Thanks Carolyn! It was definitely a challenge but I’m really happy with the end result! Such a cool layout! Love how you used this cut file too!! Love your layout and the way that you used the cut file! I enjoyed your process video and watching what you did with the Cricut file. Great layout! So glad your using the Cricut with these files. Thanks for the video. I also loved that you showed your process of altering the file in the Cricut. Great inspiration. Thanks Kim! More videos are to come in the future!! Loved the video and seeing how you got just one off the background design! 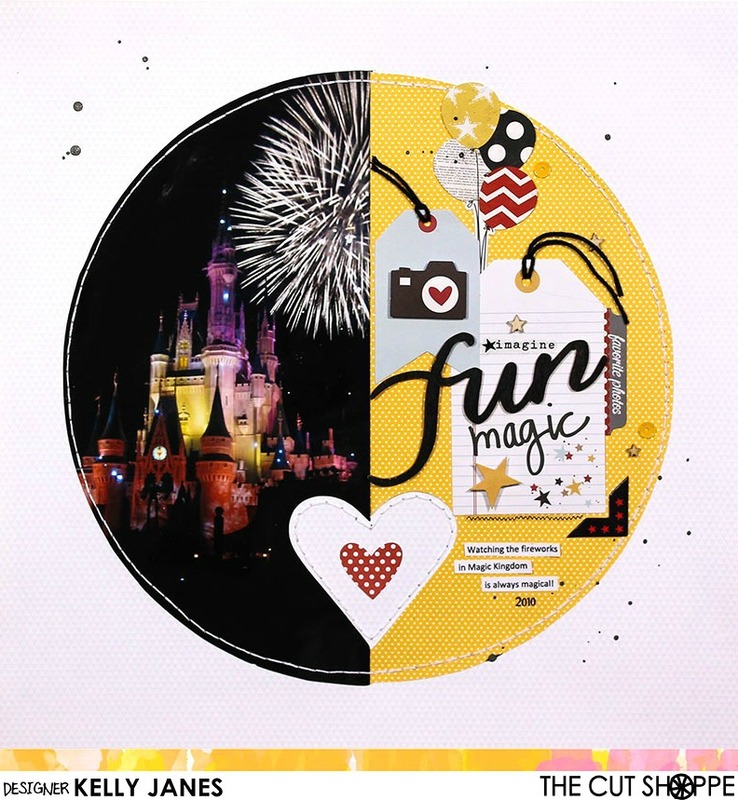 Love your layout- I have many Disney photos to scrap! Thanks for doing the video too- I am so visual i love to see the process-thanks for sharing. It took me a bit to figure out how you used the cut file but once I did….brilliant! I never would have thought to pair that picture with that cut file. Love that layout. I loved the cut file but the whole thing was a bit much for me. Using one circle and heart as a background is a great option. I will have to try that. Thanks Kathy! I would love to see what you create! Tag me in the post! !